What do Google, Facebook, Alibaba, Uber, Airbnb, YouTube, Snapchat have in common apart from the fact that they are some of the most valuable start-ups of the recent years? They are all platforms businesses! The success of these envied companies has made the platform business model the holy grail of business models. But it was not easy for them to get where they are today. All of these businesses had a hard time in the beginning. And one of the biggest challenges was to get to critical mass. Getting to critical mass is the beginning of a virtuous cycle. This is our fourth article on the platform business model. If you have read the previous articles, you can straight jump into the tactics. For those who haven’t, briefly read through the next paragraphs so you understand what we are talking about today. What is a multi-sided platform? The term platform means a lot of things to different people. Let’s be clear what the platform business model is about. For example, Amazon has many different businesses. Many people would describe them as a platform. But most of their businesses are one-sided businesses and they do not fall under the platform business model. 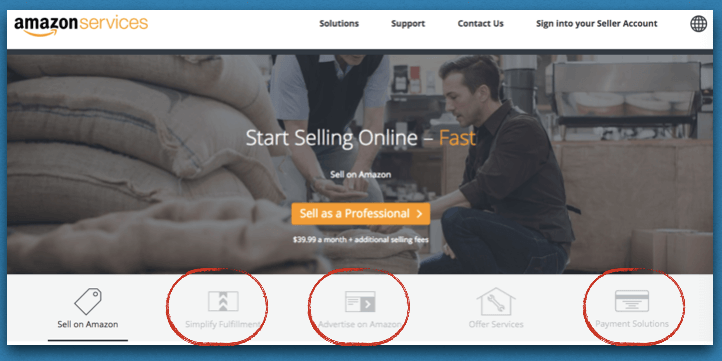 The Amazon Marketplace where other, non-Amazon, sellers can offer their products or services is one of Amazon’s few platform business models. Uber connects drivers with passengers; Google website owners with searchers; Airbnb homeowners with short-term rental seekers; Alibaba sellers with consumers. All these are two independent groups or sides as we call it in this business model. The value of the platform increases with the number of participants that a single user may potentially derive value from interacting with. If you are an Uber passenger, you need a certain number of drivers in your neighbourhood to derive value from their platform. Otherwise waiting times would render it valueless. Think about all other platforms. You will find this holds true for all other ones. This is called indirect network effects and I have explained it in part 2 of our series. But it is more concrete than that. For most platforms, there is a certain amount of other users required for an individual user to derive value from the network. If you were the only one of your friends, relatives or other relevant people to potentially interact with on Facebook, there would be no value for you joining Facebook. And if you don’t join your best friend is also slightly less likely to join. It ripples through the network. You get the idea. But it is also not sufficient if only one of your friends is there. Most people would like to have a number of people already there before they see value in joining. But how did 1.4 billion people join? How did it all get started? Well, that is exactly today’s question. OpenTable, for example, has found out that they need to have about 25 restaurants per relevant search area (e.g. suburb) before they get sufficient users interested in that area. This is their critical mass on side of the restaurant. And this helps to get the side of guests to critical mass. 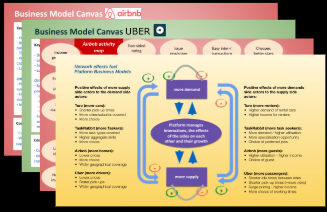 All these strategies come from three of the most authoritative books on platform businesses: Matchmakers: The New Economics of Multisided Platforms; Platform Revolution; Modern Monopolies. Uber had times where they paid drivers for just being available, including waiting around. Normally, Uber does not pay drivers for waiting around / idle time. But without sufficient supply of rides, waiting times for passenger would be long and thus the network effects would not kick-in. Additionally, Uber may pay referral fees to people who refer new drivers. These are tools in Uber’s launch kit for new cities. Quora and Reddit created and curated all their initial content themselves. Their early founders and executives created the early articles. Early employees continued on this tactic until real users started joining and creating content. Google offered $5m for the best apps in 10 categories for the Android OS to get developers moving. This gave Android apps an initial boost in catching up to the Apple App store. These examples and many others always have an element of subsidising the supply side until some momentum has been gained. This might stop prior critical mass and be combined with other tactics listed here to get to critical mass. PayPal probably had one of the most successful campaigns. They gave new users a $10 sign-up credit and referrers a $10 for any new referral. And even though this was costly, it achieved daily growth rates of 7-10%. Yelp has found out that monetary subsidies can also backfire. When paying for reviews to get to a critical mass of content (reviews of dining places), they found out that the reviews they paid for were low quality. So, they changed their approach (more in a minute). Uber’s growth in China was huge. So they decided to fight to be number one. The biggest local competitor was Didi Chuxing. Both companies gave out incentives for drivers and passenger. But Uber’s investors became increasingly wary about this tactic and pressed for it to be finished. Uber agreed to a truce in China with Didi and left the market for a minority share in Didi. This was probably one of the most aggressive cases of subsidising growth (on the demand as well as the supply side). Typically, Uber gives free rides to passengers when they enter a new city as a tactic to accelerate early growth. Game consoles often get sold at very low margins or even at loss. This is subsidising the consumer – at least for the initial purchase. Games get sold at very high margins and the game developer pays royalties to the console manufacturer. Airbnb heavily used Craigslist in the early days for its own growth. They have automatically read out rental listings on Craigslist and contacted the advertiser in order to poach them, often successfully. This one is obviously a shady tactic. Craigslist has banned such activities, once they understood what is going on. And there can be fines associated with such direct way of syphoning users from other platforms. PayPal piggybacked heavily on eBay in the early days. They created a charity bot – a program that would buy items on eBay and that insisted on paying via PayPal. It participated in auctions where the seller agreed on using PayPal for the payment. Given it was for a good cause (they secured the Red Cross to accept their donations), most sellers accepted their offer. By doing so, they created demand for their payment system. They also made their platform extremely easy to use for users. All that users needed, were a credit card and an email account. Facebook, organically, used the Harvard student network as early users. This can be a good approach if you want to build a platform for your company. It can simply be based on one side (set of stakeholders or customers, vendors, etc) that you are already dealing with. YouTube was not doing well at all in the first few months. It’s hard to believe from today’s perspective that the three founders initially even uploaded their own video’s in an attempt to get some traction. But what really helped was enabling people to embed YouTube videos on MySpace (which at the time was the largest social media network). It resonated well especially with musicians who liked MySpace. They also allowed YouTube videos to be embedded on blog pages, links to videos to be emailed thus using email as a platform. All this helped to get some viral movies onto the platform and distributed across existing networks. Between mid-2005 and mid-2006, YouTube achieved critical mass. Yelp is a platform for crowd-sourced reviews about local businesses (especially entertainment and lifestyle). It makes its revenues through advertising and consulting. But having many high-quality revues about restaurants and other places is what will make or break their business. Yelp applied several of the start-up tactics to get to an initial set of reviews. First, they created some reviews themselves. Secondly, they paid people to create some seed content. 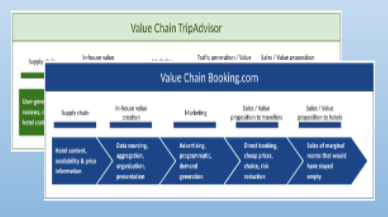 However, when they scaled this up slowly to other cities, they realised that they get many reviews written in poor quality which diminishes the value of the platform (negative externalities). So they refrained to scale this approach up any further. When Yelp started incentivised their best reviewers (measured by volume and quality of reviews), they got things going. They started giving badge icons to those super-reviewers on their profiles and received some other perks in the real world as well, such as being invited to exclusive events. Yelpers write reviews about local restaurants. But Yelpers get “reviewed” themselves through the ratings of the readers (on the dimensions usefulness, funny and cool). Here are the statistics of one Yelper. 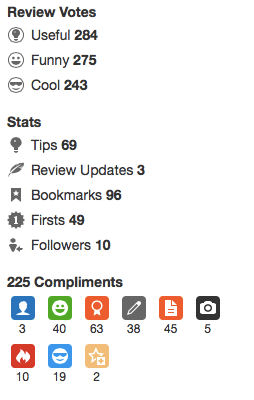 Those that contribute a lot of good reviews, can apply to become Elite Yelper for the next calendar year. Elites get different types of rewards, such as invitations to special events and more. This can affect supply or demand side but it is not so much about adding more people than a marketing exercise. OpenTable’s story is as difficult as that of many others. They were founded during the dot-com hype. So, venture capital was not an issue. But generating revenue was. They created a table management software that they licensed out to restaurants. But their main revenue idea was through bookings ($1 per guest to be paid by the restaurant that comes through OpenTable’s webpages). For a long time, they had difficulties getting to critical mass. During this time some of the upper-class restaurants still used their software as a table management system (rather that a booking system). It took a gruelling 6 years and several CEOs to get to the right idea (with the founder jumping off). OpenTable managed to sell their system to plenty restaurants. If it was not for the table management features, this most likely would not have happened. Only in 2004, the new CEO had the right idea: they left all cities but 4 (San Fran, Chicago, New York and Washington DC). OpenTable had noticed they need about 25 restaurants per relevant suburb/area for sufficient guests to be using their pages. This initiated critical mass. Previously, they were in many cities but none achieved critical mass. They also noticed it was the higher-rated restaurants that valued the table management features of their software. With this, they had their approach: Get some of the most up-class restaurants for the selected cities on board, then get guests on board. Once the cities are up and running, expand further. As you can see, this combines several of the tactics described here, but adding value through their software to one side was critical in getting through the tough times. 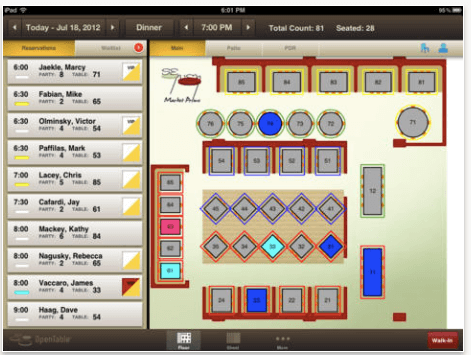 OpenTable’s table management software (here the iPad version) kept it afloat during tough times. 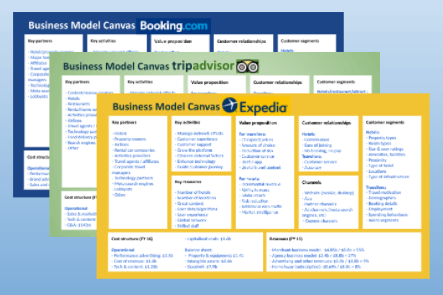 At the time (early 2000s), the platform business model was not well understood and it was not really clear that critical mass is a crucial concept for this business model. OpenTable was one of the early platforms discovering this. Instagram had offered a way to take photos with their smartphone and edit them easily, make them look good before they became a social network. Google, Facebook, Twitter, YouTube and others started as a single-sided business when you look from a monetisation perspective. From a monetisation perspective, the users are on one side, and advertisers are on the other side. Many of these businesses only later discovered their business model which ended up being advertising-driven. But while from a monetisation perspective things were one-sided, there are two sides within this one side. There are producers and consumers. For example, on Facebook, the same users generate and consume content that their peers have generated. Same on Twitter. On YouTube, the same applies but there are much less producers of videos (even if you include curation) than consumers. Google’s case is again a bit different. They have created a very useful service for both webpage owners and searchers. In all these cases, however, the second side are advertisers. Building one side first and having them as customers, then starting to add another side has some pros (lower risk) and cons (slower and not utilising the full potential initially). Adding another side to something that you are already offering can be a great starting point for existing businesses. Another option you have is to extend your assets (property, plant, equipment) to others. You may even open it up to your competitors. 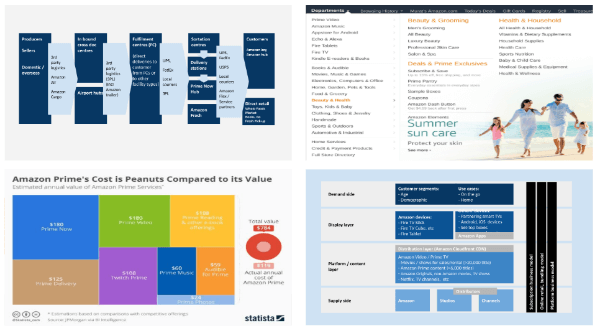 Amazon already had their single-sided business model working when they started using their assets to add a new, two-sided business to their offering. Their marketplace where customers can find services and products offered by other businesses or individuals (non-Amazon) is a two-sided platform (most of Amazon is one-sided). They were able to use a lot of their infrastructure, extend their systems for ordering, billing, their brand and so on. But the risk associated with their Capex investment was significantly lower than starting things from zero. This is another approach that can be well-suited for existing businesses. A very common tactic is to start in a local market or a niche category and then expand from there. Uber hasn’t started in the entire US at the same time. As you know they start city-by-city. They debuted in San Francisco in June 2010. They started New York City almost a year later. Facebook started at Harvard Campus where they connected students who knew (or wanted to know) each other. And they continued with other campuses before they expanded beyond the university world. Almost any platform starts in some limited environment, geographically, category and the like. You have to remember though that the value of the platform increases with its network effects. And it may be possible that its potential may be underestimated by starting a network this way. It is sill the most sensible way to approach it but just keep in mind, that the value will grow faster with its size. Microsoft: When Microsoft announced Xbox they committed $500m to promoting it. This gave reassurance to game developers who themselves have significant upfront investments developing games before they incur any revenues. Android: Google has put in the hard yards of developing Android prior to launching it together with the Open Handset Alliance (OHA). Google acquired Android Inc and continued the development of the operating system. In parallel, they formed the Open Handset Alliance with 34 founding members of large telco companies from handset manufacturers to network operators (see tactic 3 of getting high-value users early). All members committed to using Android only. Google’s commitment to keeping Android an open source platform and continue its development gave certainty for the other OHA members. The early OHA member’s commitment gave certainty to those that joined the OHA over time. What does this mean for your innovation idea? Successful platforms will have used several of the tactics above in parallel or at least at different times. When you study their path, you will always see how the early days were very difficult. Many of the platforms have tried several of these tactics. The early platforms did not even have a name for their business model let alone know that critical mass is a crucial concept for it. Many slowly discovered the different tactics. and others followed these tactics (and so can you). But there is no cookie cutter. For any platform, the application of these tactics may differ. And even within the same platform, you may have guiding principles but not a script. Though Uber is now in many cities, they seem to not enter every city in the same way. 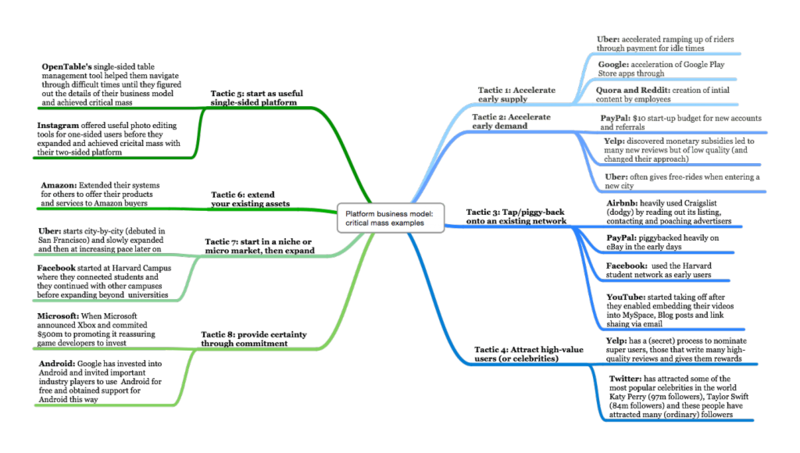 Use as many of these tactics as required to get your platform idea to critical mass. 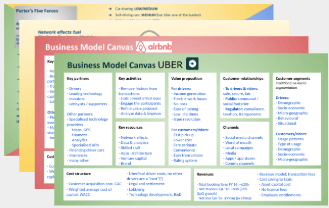 If you have already completed the worksheets from the previous articles on the platform business model, great! Dig them out and now continue on the below questions. If you haven’t done these worksheets, you can use the first questions below to get your thinking started on a potential platform business idea! Download the worksheets (click here) and get your innovation idea started! In either case, have fun! Take 20-30 mins to complete the exercises. 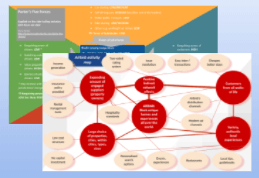 As always download the worksheets that also have some additional slides for you (in this case the above mindmap). If you don’t yet have a platform idea but work for an established company: can you extend your existing assets (property, plant, equipment, intangible assets) in a way to start a platform (tactic 6) or use any of your existing single-sided offerings in a way to do so (tactic 5)? For your idea, what would be a good way to get started? Should you be addressing the whole potential market immediately or would it be better to start in a niche, one geographical location, a category (tactic 7)? Accelerate the supply side (tactic 1)? Accelerate the demand side (tactic 2)? Piggy-back on an existing (offline or online) network (in a non-dodgy way) (tactic 3)? Get very important/authoritative/celebrity users on board? Who are they? What can you offer them so they join (tactic 4)? 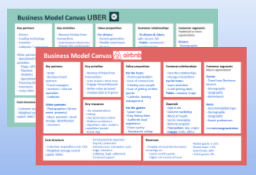 You can read all our articles on the platform business model here. Definitely, don’t miss out on the next article that shows 5 proven tactics to get started with your platform business model.